What exactly do you mean by varying the pressure? I'm trying to picture that concept applied... And failing. A long overdue update has arrived at last! Oh, wow, I've been waiting to see this guy finished myself for awhile and I am very pleased with the outcome. Please welcome Jade, the hero of Llorynica Kingdom! As the eldest of the Prism brothers, and the primary provider of the family, Jade walks in the footsteps of his beloved father. Jade is a Sword of Lloryn, a devoted knight to serving his kingdom and the well being of its people. He lives by a code of honor, and it is not easily broken. Family comes before all else - over common folk, over royalty, and even over the gods. He finds companionship otherwise among his fellow Swords, most in particular his friend Gemel. With his ability to follow orders, and even give them just as well, Jade finds himself protecting not one ruler, but two in his time of service! No matter what life brings, he only wants one thing: to see his father once more, whom he believes is alive and well despite the passing years. He holds fast to this hope even in his darkest hours. [Jade had well over 30 layers of color. That's CRAZY. But it paid off because his color scheme looks amazing even by my standards! I'm loving how his clothing speaks volumes about him that even I can't put exactly into words. Not the average knight you would think of just clad in full silver armor, but then again he isn't your average swordsman. Love love LOVE his sword. It is named Windsong, gifted to him by his friend Gemel. The blade was named almost on the spot after Jade took his first swing - it rings softly, almost like it is whispering. Definitely a magical sword. Ooooh! I love the shiny coloring! Man, a lot has happened since last time. Some good, some bad. One of the twins (the other being Solis) in the Prism family, Shaydenn is well known throughout the kingdom of Lloryncia for his complete lack of respect for all figures of authority. Let's just say that he doesn't buddy up to the Swords(the city high guards), and he gives his brother Jade plenty of headache too for being one himself. He is the voice of sarcasm in any group, whether wanted or unwanted. Might as well just expect a nickname while we're at it. Shaydenn gets along with few people, so his twin Solis is just about the only one that truly does understand him and tolerates his shenanigans. He admires only one other living person besides himself - that being Alyssa Cade, the girl of his dreams. Which he desperately is trying to win over. Everyone else is an afterthought, if even that. But even he learns a thing or two when he is forced out on a journey alongside Jade and Alyssa to a distant land called Vicebeh. [Shaydenn had well over 40 layers of color! I'd say that is crazy, but my pictures to come might surprise me. From what this picture was to how it looks now, the update is just jaw-dropping in my opinion. Shaydenn has a very different color scheme from his other brothers that I've already updated so far. And, actually, he was the first of his family that I put together! So, his personality really had enough impact for me to know exactly how I wanted him right from the start. Although, as you can see, he has gone through some changes here and there while getting an overall cleaner paint job. The one thing I want to point out is the updated symbol on the cloth directly attached to his belt - the original image had a mere wolf outline, but now the Den Mother Ulloryn is depicted with a lovely moon to accent it. Why point that out? Well, there's a little story to go along with this. The cloth there was actually a dress worn by his mother on the day she was killed. The dress was cleaned, cut, and modified by Shaydenn to wear in her honor. The necklace he wears is also one of his mother's, which he is never seen without. I also like the edits to some of his armor and his sword. Definitely the sword(named Eventide), as it got some great embellishments and extra detail added in. And as I mentioned, this is a revamp. Here was the original image for comparison. 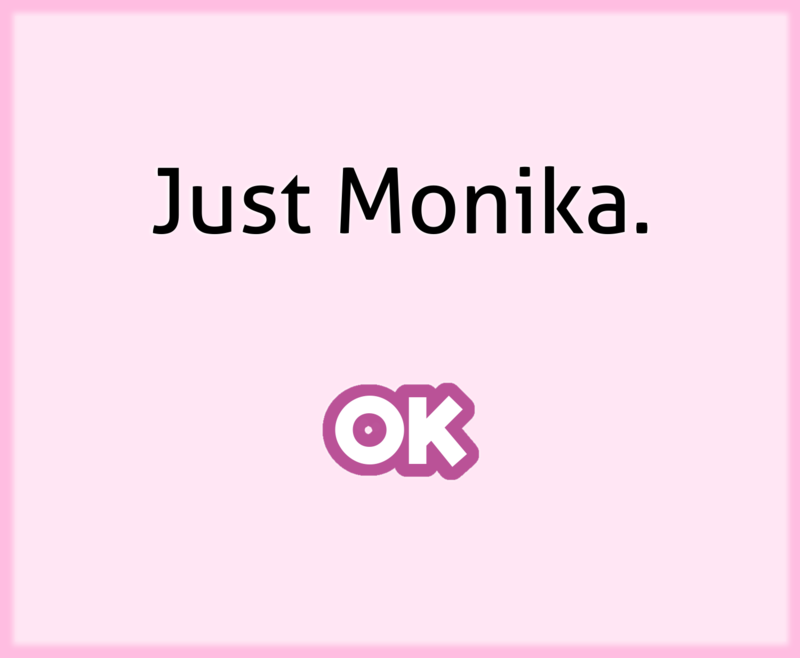 Sorry, I didn't see this post. I think this image might help you understand a bit better. My next piece here is as much artwork as anything else really. 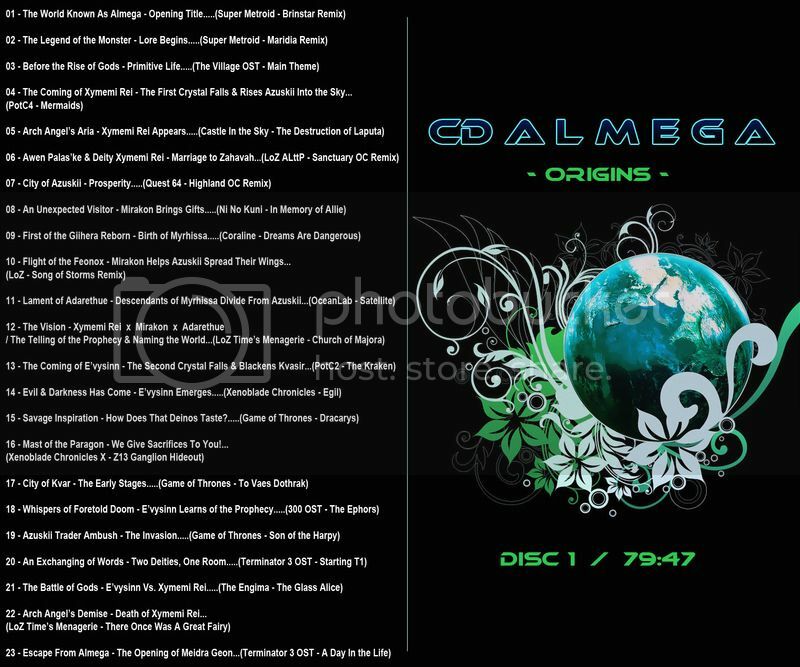 It's a CD cover art for a makeshift soundtrack for, you guessed, Almega. I started in the story's Origins and went from there. You'll likely be seeing more of these as I go along. Beautiful cover!! I'll give them a listen when I'm at my computer! Well, it should be really super easy to listen to now - I made a Youtube playlist to make it easily accessible. Page created in 0.265 seconds with 26 queries.